British MEP Daniel Hannan has inspired a new hashtag as Twitter users reacted to claims he had made a string of inaccuracies about Irish history. #HannanIrishHistory was trending after Mr Hannan used Ireland to make a point about the EU in a comment article, but a number of journalists and academics disputed his claims. In particular, he claimed Fianna Fáil had won every Irish election between 1932 and 2008, when in fact Fine Gael had come out top on six occasions during the period. When the errors were pointed out to him, Mr Hannan said "historians necessarily have different takes on the same event", adding "Please try to accept that yours is not the only interpretation." But Twitter users were quick to mock the MEP with their own humorous takes on Irish history. Derek Mooney, a public affairs specialist, referenced Mr Hannan's Fianna Fáil claim directly, joking: "Though @fiannafailparty had won every Irish election since 1392 (sic), it was dumped by voters after its 2010 #Eurovision entry failed to make the final, this sparked a run on the Euro and the banishment of Louis Walsh to ITV #HannanIrishHistory". Steve Peers, a lecturer in international law at Essex University, tweeted: "The statue of Oliver Cromwell outside Parliament commemorates the Nobel peace prize which Cromwell won for ending the Irish Civil war #HannanIrishHistory"
Writer Dean Van Nguyen wrote: "Fionn mac Cumhaill burned his finger on the Salmon of Knowledge because of EU regulations on food labelling #HannanIrishHistory." Another Twitter user told a longer tale, joking: "Michael Collins faked his own death in 1922 in what was then Ireland's largest insurance scam. Collins would later flee to America and flew the Apollo 11 mission. He would be immortalised in the song 'In the air tonight' written by his brother Phil #HannanIrishHistory." 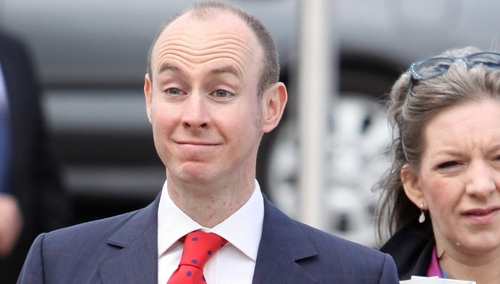 Mr Hannan did not respond to requests for comment.